Cabinet or multimedia center cooling kit. 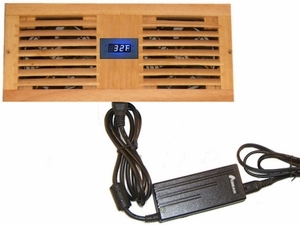 This is a complete *kit with oak grill, LED thermal controller, power supply and accessories. Includes (2) Ultra quiet 120mm Fans Pre-drilled holes for 120x120x25mm fan installation and a Programmable LED Thermal Controller.